Amid growing concerns about childhood obesity and the associated health risks, several countries are considering banning fast-food advertising targeting children. 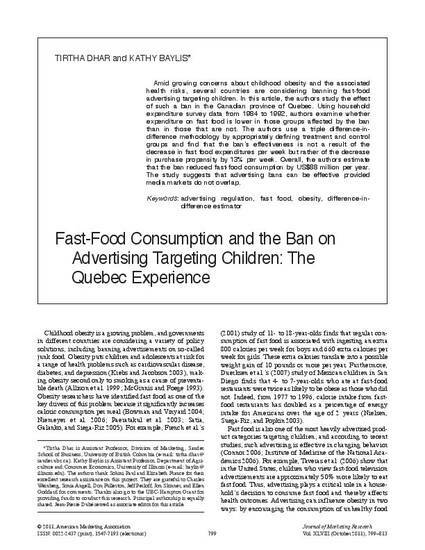 In this paper we study the effect of such a ban in the Canadian province of Quebec. Using household expenditure survey data from 1984 to 1992, we examine whether expenditure on fast food is lower in those groups affected by the ban than in those who are not. We use a novel triple difference-in-difference methodology by appropriately defining treatment and control groups and find that the ban’s effectiveness is due not to the decrease in fast-food expenditures per week but to the decrease in purchase propensity. Overall, we estimate that the ban reduced fast-food consumption by US$88 million per year, which translates to approximately 3.4 billion fewer calories consumed. Our study suggests that advertising bans can be effective provided there is no media-market overlap.